Most homeowners will need to contend with at least a few plumbing leaks over the years. Fortunately, many leaks are quickly identified and repaired before significant home damage occurs. However, there are also many instances when homeowners are not so lucky. A major rupture or even a small leak that goes undetected may have serious and expensive consequences for the homeowner. Follow these important steps to prevent plumbing leaks at home and avoid dealing with water damage and related issues in the future. Water must remain well-controlled at all times in the home. You need it on-demand when you need to wash hands, get a drink, take a shower, or use water in other ways. When water does not remain contained in pipes, sinks, and other plumbing features, property damage can occur in a very short period of time. For example, wood and drywall may be damaged beyond repair within less than an hour in many instances when they are exposed to excessive moisture. The electrical system, carpeting, and other features could also be seriously damaged. There is also a strong risk of mold growth when plumbing leaks occur. While not all causes of leaks may be avoided, there are steps that you can take to prevent at least some of the possible culprits. To prevent plumbing leaks at home, the matter of ruptured pipes in freezing weather conditions needs to be addressed. Some pipes, such as the hose spigot on the exterior of your home, may be exposed to the elements. This pipe and any remaining water inside of it may quickly freeze. Water expands and takes up more room in a pipe as it freezes. This outward pressure is why frozen pipes burst. 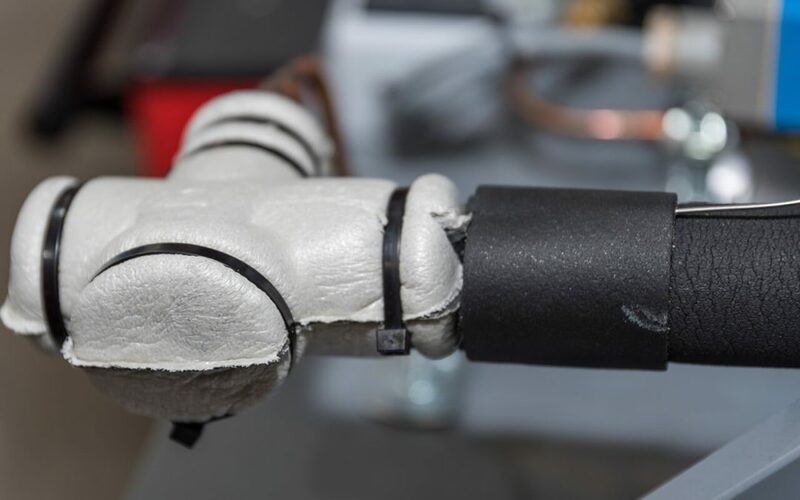 Wrapping exposed pipes in pipe insulation reduces the chance of exposed pipes rupturing. Moving water is less likely to freeze than water sitting in a pipe. When your faucets are not actively drawing water, the water in the pipe becomes stagnant and more likely to freeze. Pay attention to the weather forecast and allow your faucets to slowly drip when the outdoor temperature is below freezing. This includes the kitchen and bathroom sink faucets and the tub faucets and showerheads. Keep your exterior spigot turned off. The pipes that run along exterior walls in your home may be at least partially protected by insulation in the walls. However, the pipes underneath your sinks are not insulated. In addition, the air in the cabinet may be cooler than the heated air in your home because it’s an enclosed space. During freezing weather conditions, open all cabinet doors underneath your kitchen and bathroom sinks. The heat will have a moderate impact on warming these pipes and to help prevent them from freezing. When you need to know how to prevent plumbing leaks at home, freezing weather is not the only thing to focus your attention on. Some leaks occur because of aging or worn out components. For example, when gaskets, washers, and O-rings wear out on a faucet, you may notice dripping or a slow leak. These types of plumbing issues are easy to fix once you are aware of them. Knowing how to prevent plumbing leaks at home is important for home maintenance. Now that you know how easy it is to prevent many types of plumbing-related damages, you can begin taking action as needed. Scout Home Inspection provides home inspection services to New Hampshire and Maine. Contact us to book your appointment.